Autumn is very slowly beginning to creep into Little Rock, although you wouldn't guess it based on the temperature (all-time high today of 98 degrees). But a few trees are starting to show some fall colors, a few weeks before they usually reach their peak. 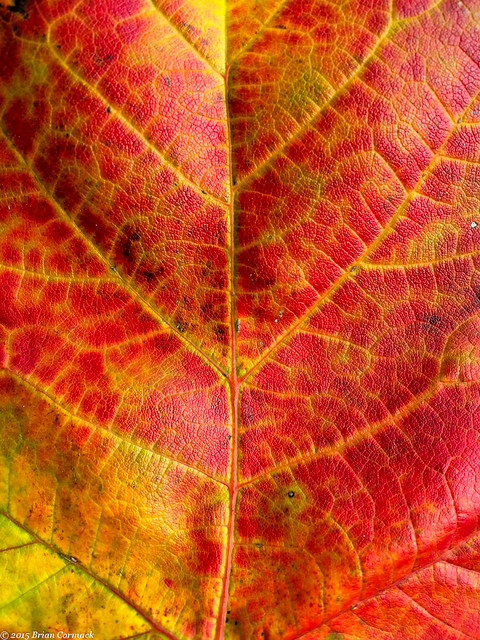 This leaf fell by my office, and I snapped a quick picture of it while on break. My work is located far out in the suburbs of west Little Rock, and one day after work I headed out to take a few pictures in the rural lands that sit just beyond the city limits. It's amazing that you can find some great hidden spots, all just a quick drive from the city. 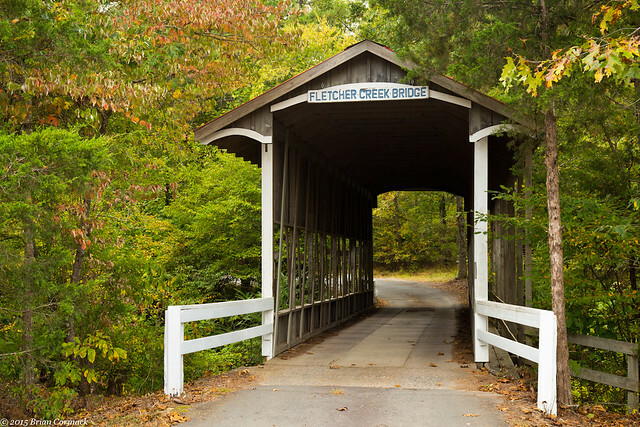 There is an old covered bridge that is just a short drive from my work, located above the quiet Fletcher Creek. 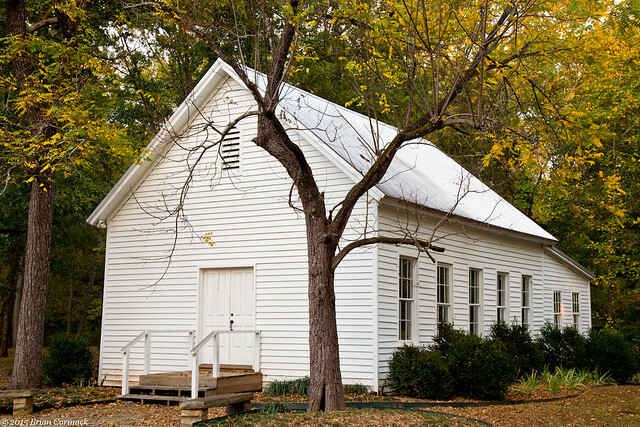 Down the road is an old church, the Walnut Valley Methodist Church. It was built in 1885, and has been completely restored. Although the Little Rock suburbs have been steadily encroaching, this area still has a rural feel to it. That all will change, unfortunately. A new development has been planned for this area, which will place 266 homes in a 154-acre subdivision. The development will completely wreck the peaceful valley, knocking down the thick forest and polluting the creek. There is still a chance that the subdivision plans will be denied, and the homes moved to an area that would be a better fit for a large subdivision. 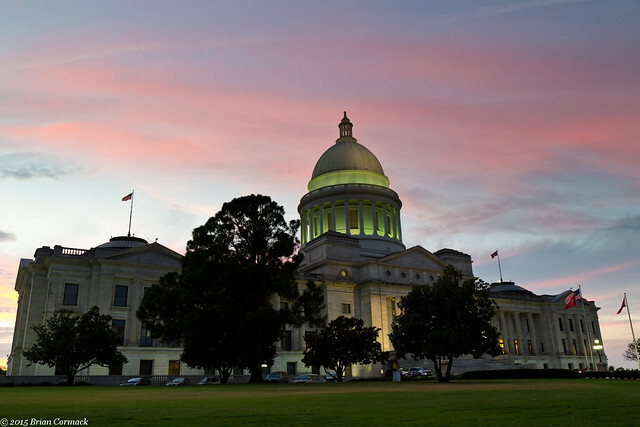 I headed out last week to try to take a few pictures in downtown Little Rock, and ended up driving by the State Capitol right around sunset. They were just starting to switch on the big lights on the capitol, which is why part of it is darker and part of it is green. 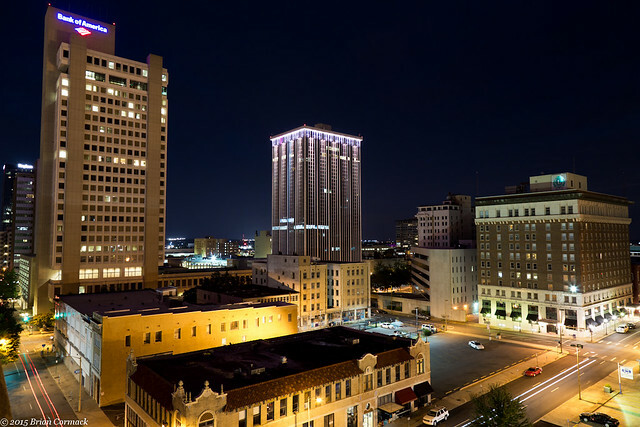 I drove a few blocks over and went to the top of a parking deck, which provides a bit of a different view of downtown. 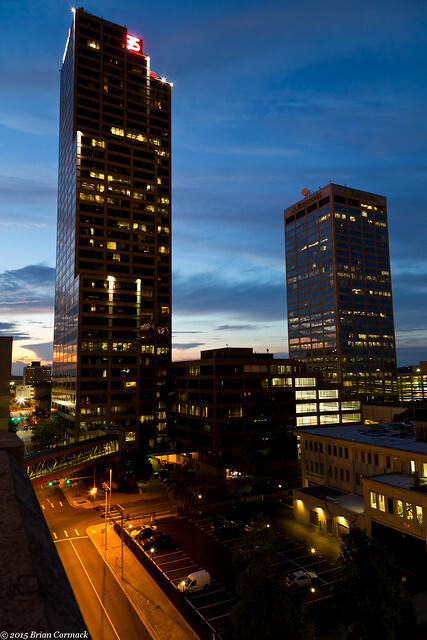 It sits across the street from the Simmons Tower, which at 40 stories is the tallest building in the state. Also in this shot is the Regions Center, which is the second tallest building in the state. And one last shot, looking north from the parking deck. There is a restaurant in one of the buildings on the corner, and I was very tempted to rush down there to have dinner. It smelled like bacon was cooking, and the scent of it must have drifted up in a cartoon-like cloud to the top of the parking deck. I was ready to abandon the camera, but stuck around to take a few more pictures before heading home.